They also believe that the letters of their alphabet have existed forever, and accomplished various services before the beginning of the world, by which it is reasonable that they preside in the world, indeed [they believe that] the Mosaic law was written many years before the world. They also affirm that there are many worlds, many hells, and many heavens, of which they say one, which they call racha, i.e. the firmament, supports God’s millstones, with which the manna to be consumed by angels is ground into food. Indeed another one they call araboth, in which they affirm God resides, and this is according what is in the Psalms: “make way for him who ascends above araboth” (Ps. 68:4). [They say that] because of this God has seven trumpets, one of which measures 1,000 cubits. And what more? There is no page, no sentence of the Old Testament about which either they do not have lies fabricated and composed by their elders, or they do not always fabricate a new superstition to this very day, and they presume to respond to questions. For they also read in the teaching of their elders that Jesus was once an honourable young man among them, and instructed in the teaching of John the Baptist. 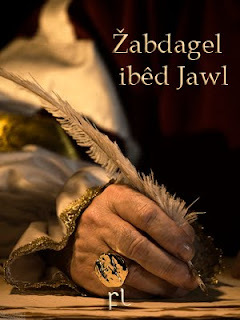 Ve isdsegukwurin wigdal ve ařğžareain eff Igebscg vedusyskge jiskařd fia tvekulldag ve vedusia eff fedi Zêve amğuan edd Igebscg Zita. Ve ğuş kasiğell nisevunil i kuyskk čummscia eff ve zufa edd žakl. Sem vean, ve tveresdreain susst nir abel is-niğdi zugia eff Igebscg is ve rejitag vsêg ğêsdi kasiğelsl.